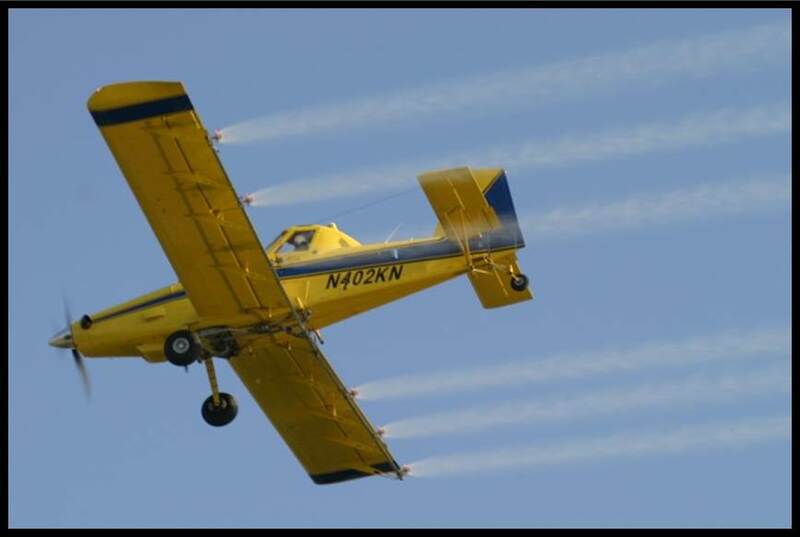 On Thursday, April 20, 2016, the Ohio Department of Agriculture (ODA) announced that they will soon begin aerial treatments designed to control the gypsy moth population in Ohio. Treatments on 1,474 acres in Perry, Ross and Scioto Counties will begin in late April, as larva and leaf development reaches the optimal threshold for treatment. Brett Gates with ODA shared that treatments are administered using a low-flying aircraft that flies just above tree tops just like the photo shared with this article online. High humidity, low temperature and minimal wind are crucial for a successful application. These treatments will most likely take place during early morning hours. In a media release, ODA shared that they will use Foray (Btk), a naturally occurring bacterium found in the soil that interferes with the caterpillars’ feeding cycles and Gypchek (NPV), a virus that affects only the gypsy moth caterpillars and has no effect on beneficial insects. These treatments are not toxic to humans, pets, birds or fish. Ohioans can view maps of treatment blocks at the ODA website by clicking on this link: www.agri.ohio.gov. Daily updates on treatment progress across the state are available on the website. Gypsy moths (Lymantria dispar) are invasive insects that feed on the leaves over 300 species of trees and shrubs in woodlands and landscapes. In its caterpillar stage, the gypsy moth feeds causing the trees and shrubs to become bare. The caterpillars are especially fond of oaks (Quercus spp.). A healthy tree can usually withstand only two years of defoliation before becoming more susceptible to other pests or even dies. In Ohio, 51 counties are currently under gypsy moth quarantine regulations. The ODA uses three programs to manage gypsy moth populations in Ohio. The suppression program is used in counties where the pest is already established, but landowners voluntarily request treatment to help suppress populations. The second program, slow-the-spread, occurs in counties in front of the larger, advancing gypsy moth population. The third program is the eradication program, used in counties where isolated populations develop ahead of advancing gypsy moth populations due to human movement of the insect. Officials work to detect and control isolated populations to slow the overall advancement of the gypsy moth infestation. Additionally, homeowners dealing with a gypsy moth infestation in a smaller or more confined area, typically work with local arborists to discuss treatment options.